What’s the best thread for fly tying? One of the benefits of social media is its ability to open lines of communication. I frequently receive pictures of various fly patterns that people have tied. In tandem with these photos, I’m often asked for my thoughts on how to improve the quality of the shared pattern. My first point of emphasis usually lands on a thread related element. In general, as the fly size decreases so should the diameter of the thread. This is essential knowledge for any tier that is looking to create a higher quality product. All threads are broken in to sizes ranges. The two most commonly referred to sizing categories are Aught and Denier. Threads measured in the Aught range are best used for patterns that do not require smoothly built up thread bodies or other portions of the fly. This is due to the fact that these threads do not lay as flat when wraps are laid down. For this category a larger number signifies a smaller diameter thread. For example a 14/0 thread has a smaller diameter than an 8/0. 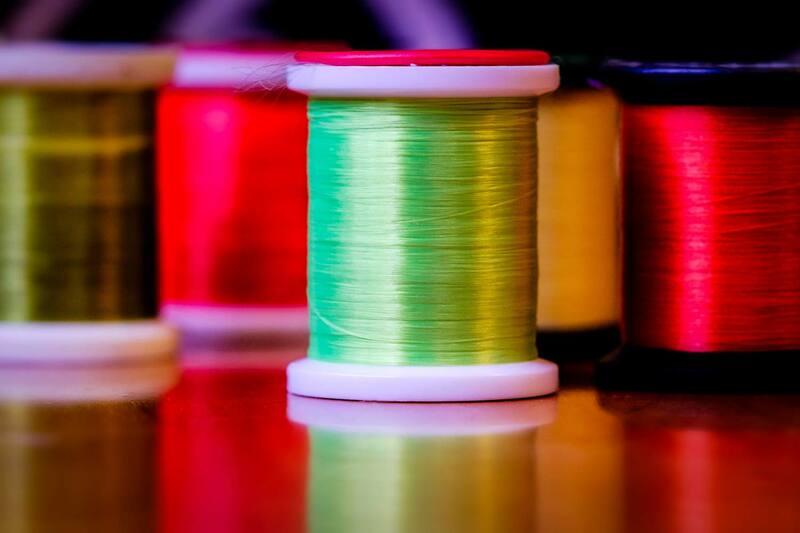 Due to advancements in thread technology, even smaller diameter Aught threads can display exceptional strength. In a turnabout with Denier threads, a larger measurement number signifies a thicker diameter thread. For example a 140 Denier is thicker than a 70 denier. These threads are ideal for patterns that require built up thread bodies or use of the thread for ribbing. This is due to the fact the thread spreads and lays flat when wraps are laid down. Without going into recommendations of brands, I always follow one rule when selecting thread size. Use the smallest and strongest thread possible that will allow you to create the desired pattern as effectively and efficiently as possible. The smaller diameter threads will reduce excess build up and improve the overall quality of the fly. The increased strength will allow you to tie at an efficient pace without having to slow down over concerns of breaking the thread. Following these simple guide lines will aid you in adding more quality bugs to your box. This entry was posted in Fly Tying, The Hot Ticket and tagged What's the best thread for fly tying? by Louis Cahill. Bookmark the permalink.